June 15, 2014 (KHARTOUM) – The retired Libyan general Khalifa Heftar who is leading the military campaign dubbed as ‘Operation Dignity’ against Islamist militias accused Sudan directly of providing aid to these groups. “We have information confirming the undertaking by Sudan of providing aid to these groups. We refuse to see such behavior from Arab brotherly states and we hope that this information is incorrect,” Heftar told Saudi-owned al-Hadath TV. “Egypt, Tunisia, Algeria, Chad, Mali and Niger and all neighboring countries support us through border control, yet we do not need any military aid from these countries,” he added. The general stressed that Libyan people back his efforts against “terrorists” vowing to soon “bury” them under their feet. Heftar also accused Qatar of fuelling Libya’s chaos. "There is no doubt Qatar supports the militias in Libya," he said. Last week, spokesperson to Heftar’s forces Colonel Mohamed al-Hejazi, told Cairo-based al-Youm al-Sabe’ newspaper that Sudan is dispatching planes carrying weapon shipments to Libyan Islamists. He said these weapons have already been delivered to a militia loyal to Abdul Hakim Belhaj adding that Qatar funds these shipments. But Sudan denied these accusations and its army spokesperson Colonel al-Sawarmi Khalid Sa’ad said that “relations between Sudan and Libya and particularly the military [one] is now at its best and proof is the big military cooperation in the field of training”. Col. Sa’ad also recalled that Libya and Sudan have joint border forces to combat human traffickers and terrorists. Heftar’s rise came after he claimed that his forces represent the legitimate Libyan army and has managed to win the support of military units inside Benghazi for his offensive against the jihadists. The Libyan government, however, accused him of trying to stage a coup but Heftar says that these militias have wreaked havoc in the North African nation. SUDAN IS LUCKY BECAUSE THE LION OF AFRICA IS GONE. SOMEDAY ANOTHER LION OF AFRICA WILL SURFACE WITHIN LIBYA. GOD IS WILLING. 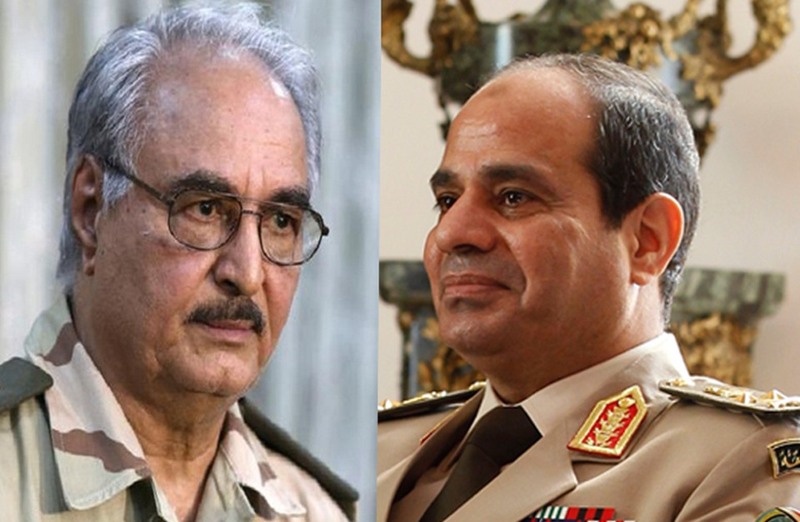 Khalifa Haftar is no more than another Sisi in Libya, another agent who works for rich Arabs countries in the Gulf and CIA to kill the Arab spring in Libya and the region, to kill any project that can lead to real democracy and allow Arabs to live as free people! Khalifa Haftar history is very dark, he was defeated so badly by Chadian army during Libya-Chad war over Aouzou Strip that Ghadafi occupied it by force while it was never belong to Libya, Haftar was the supreme Commander of the Libyan army during that war in 1987, guess what? Hafter was defeated and arrested by Chadian army..what a shame?! Although the Chadian army was weak at that time compared to what Libyan army had in terms of warplanes,tanks,advance weapons,etc but coward Haftar was defeated and they captured him alive! what a shame! Coward Khalifa Haftar is accused of killing the Chadian prisoners of war during that war, he is also accused of killing many Libyan officers and soldiers during that war accusing them of treason by escaping from the battlefield! Sudan will never ever support the Islamic extremist groups in Libya but will support the legitimate moderate elected government in Tripoli.